Dudley was not ambitious in the meaning that word is usually used. Dudley was not ambitious for himself; he was ambitious for the human race. 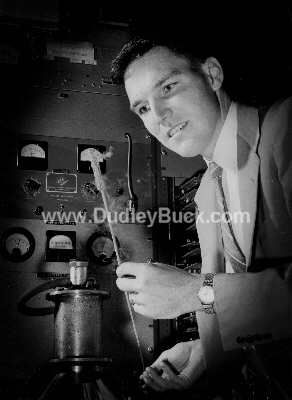 This website is dedicated to Dr. Dudley A. Buck. Although taken from this world too soon, his inventions and scientific research forever changed the world. The photo above is of Dr. Buck with an array of Cryotrons. The Cryotron was the most widely known of his inventions. It was some of his other work, however, that had the biggest impact on our world. The Massachusetts Institute of Technology publishes a newsletter called RLE Currents. The December 1988 issue included an article on pages 18 and 19 about Dudley's work at MIT. Click here to read this article. By his early teen years, Dudley Allen Buck was building and repairing radios. In 1943, at only 16 years of age, he earned his Amateur Radio License W6WCK and the top F.C.C. commercial radio operator license which let to his employment as an engineer at KTMS; a 50,000 watt radio station in Santa Barbara. After high, school the Navy sent 17 year old Dudley to the University of Washington to study electrical engineering, radio, and radar theory. In 1948, upon earning his B.S., Ensign Dudley Buck was assigned to Naval Communications Supplemental Activities – Washington, with a duty code of 1615 – 'cryptography'. For the past 60 years "the nature of this duty is classified" was all anyone knew about his assignment. CSA-W on Nebraska Avenue in D.C. housed 121 “bombe” computers which were breaking the Japanese and German cyphers since early in World War 2. At CSA-W Dudley worked for the top men in cryptography; Joseph J. Eachus, Howard Campaigne, George Cramer. At CSA-W he was noticed by William F. Friedman, the man that put the US cryptological institution together before the war. It was during this time E.R.A. designed and built the impressive “ATLAS” computer specifically for the Armed Forces Security Agency. Dudley served his two years Navy service there at CSA-W. In 1950, on his 23rd birthday, during some of the most tense times of the cold war, the Navy sent Dudley to Berlin. Upon arriving in Germany, Dudley reported to a C.I.A. cover organization; the 7821 Composite Group. Even today, this 6 week mission remains highly classified. After returning from this secret assignment, Dudley entered Massachusetts Institute of Technology as a researcher on input/output systems for the secret project “Whirlwind”. During project Whirlwind he also earned his MS degree along with good friend and founder of DEC, the well-known Ken R. Olsen. In his first years at MIT, Dudley was involved in many types of research. He became a consultant for the Armed Forces Security Agency. He continued on as a electronics consultant for the National Security Agency when it absorbed the AFSA in 1952. Over the years Dudley consulted with the top scientists in the USA; Seth Nedemeyer from the Manhattan Project; Zolton Bay who developed the process of listening to enemy radar from signals bounced from the moon; Louis Ridenour, one of the developers of ILLIAC, Harry Huskey, leader of development of the SEAC and SWAC computers, and many more. With research covering the spectrum from techniques to locate natural stores of deuterium, to highly advanced methods of secret communications, it is surprising that Dudley made time to invent the cryotron. In the mid-50's the cryotron showed promise to enable development of computers that would be thousands of times faster and hundreds of times smaller than anything known. Dudley served as a Scoutmaster for the Wilmington troop of the Boy Scouts of America. He was a lay-speaker in the church. Elected twice to the school board. He even served part time as instructor for students of the National Security Agency in electronic techniques for intelligence gathering. One of Dudley's students went on to invent the infra-red camera; others would rise to the highest positions in America's security and scientific research agencies. Key breakthroughs in the development of the integrated circuit, development of plasma displays, electrically programmable read-only memory, and many more advanced technological developments were made there in Dudley's laboratory at MIT. In 1958 as a gesture of goodwill, the United States invited the Soviet Union to send its best students to study at American universities. Allegedly unbeknown to the US, all of these students were KGB agents. One of the agents was Oleg Kalugin. Kalugin's impressive success at planting spies into the NSA would be a stepping stone to the highest position in the KGB. In April of 1959, a delegation of 7 top Soviet computer scientists visited facilities and staff at I.B.M. and M.I.T. Included on the tour was a meeting with Dr. Dudley Buck. Vice President of Lockheed Missile Systems scientist Dr. Louis Ridenour, in the previous December, told President Eisenhower to appoint Dudley Buck to his National Security Agency Scientific Advisory Board. The NSASAB consulted directly with President Eisenhower on matters such as the future of the U2 spy plane, the Corona spy satellites, and early detection of Soviet attacks. Dr. Ridenour and Dudley were scheduled for two days of meetings in late May 1959. Three days before this meeting was to begin, 32 year old Dudley Buck died of a mysterious illness. On that very same day, 47 year old Dr. Ridenour would die. From Alan Dewey's research, Iain Dey and Douglas Buck have written "The Cryotron Files" about Dr. Buck, his work, his students, and the scientific adventures which he inspired. Many that knew him are no longer with us. However, those that were located provided invaluable insight, documents, and photographs, for our search through history.